Up at 8:00 and as soon as we are ready we are out of the room as the plan is to eat at the Kona Cafe in the Polynesian before meeting Ronnie and her family in front of the Diamond Horseshoe Revue at 11:00. As usual when the Stringer family are on the move things don't go exactly to plan. We wait for the Magic Kingdom bus but it is taking a while so when an Epcot bus turns up we decide to hop on it and then get the monorail to the TTC. This takes longer than intended due to a short wait for the monorail at Epcot and we finally reach the Kona Cafe at about 10:20. Luckily we are seated straight away. The purpose of breakfast here is to try the Tonga Toast. The pigs .... er... I mean, the family devour it and give their considered opinion. MMMMmmmmmm! This is a 100% sure fire hit with all of us. The ham that comes with it is also good. Having read about Tonga Toast I was expecting something similar to French Toast. What I was NOT expecting was something akin to half a loaf of bread, filled with banana, coated in cinnamon and smothered with enough sugar to keep the economy of a small Caribbean island on course for a year. There must be a million calories in this but, boy, is it good. It is immediately put on Tammy's list of things that must be done again before the end of the holiday. By the time we have finished it has gone 10:45 and we rush off to the monorail. We enter the Magic Kingdom at 11:02, route march across to Adventureland and arrive about 10 minutes late for our meeting with Ronnie. She is, of course, very gracious and accepts our apologies. After introductions to Grandma we head off to the barbers shop on Main Street where Mike (Ronnie's husband) and I are going to get our hair cut. I suppose it must be about time as I look like a cross between a rock musician and Cousin It. 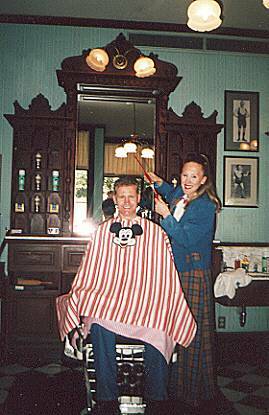 The ladies in the barbers shop are very good, chatting away while Ronnie takes pictures for her web site. Mike and I both come out looking much improved (mind you, how can you improve on perfection?) as Tammy and Ronnie look up at us in awe, as doe eyed as two love struck teenagers. Or it might have been pity, I'm not sure. Off to Splash Mountain where we all ride except Tammy and Georgia. 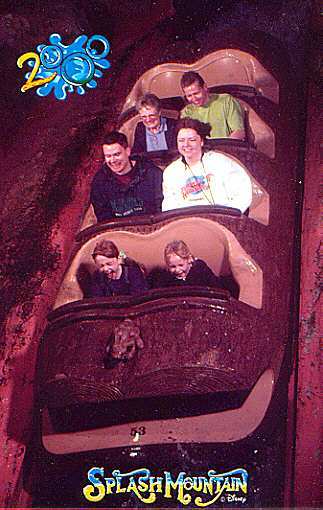 This is the wettest Splash Mountain ride I have ever known with India and Jill (Ronnie's daughter) taking the front seat and getting very wet. India's trousers take hours to dry out. Ronnie buys two copies of the picture and kindly gives one to us, lovely lady that she is. It shows the two girls screaming their heads off while Kevin looks ice cool and composed in the back seat. Well, maybe not. This is really the only walk on of the day, the crowds seem much heavier than for the last two weeks. The other thing that you should know is that it is cold today. Although in the high 60's and sunny for most of the day there is a very chilly north wind. I'm sure there are many people regretting wearing the shorts and t-shirts today. The queue for Big Thunder Mountain is 35 mins so we go back to watch the Diamond Horseshoe Revue. This is a nice little show with a singing cowboy, an excellent magician / card trickster and the lovely can-can dancing saloon girls. Mike and I particularly appreciate our front table seats for this last section. In fact we appreciate it so much that Ronnie and Tammy have to furl up our tongues and poke them back in our mouths at the end of the show. I'm a little vague on the order of things from here on in but I'm sure Ronnie will put me right if I get it wrong. Pirates of the Caribbean is next before we return to Big Thunder Mountain. Everyone rides except Grandma. This is Georgia's first time and she loves it. She has certainly got over her early scare on Splash Mountain and is willing to try most things now. Tammy, Grandma and Georgia now go to Ariel's Grotto as Georgia has been dying to meet her. The rest of us head for Space Mountain but there is a 35 minute wait so we all go on Buzz Lightyear's Space Ranger Spin instead. I triumph with 240,000 points due to superior skill and tactics, or could it be just pure luck? We meet up again in Fantasyland where Tammy has taken the opportunity to sample a peanut butter brownie cup fudge sundae, probably took me longer to write that than it did for Tammy to eat it. Snow White has very little wait so on we all go. The 3 girls are now riding together. On to the Pooh ride to use our fastpasses that we got earlier. Without these the wait is 1 hour! Ronnie explains that it is probably because it's Martin Luther King Day on Monday and many people have made a long weekend of it. I enjoy Pooh even more than before particularly after Ronnie points out the picture of Piglet in the queue area looking like he is desperate for the bathroom. We head off for Space Mountain again but Georgia throws a paddy so I have to go with her and Grandma to ride Buzz while the rest blast off through space. Another lifetime best for me with 325,000 points, due in some small part to the ride slowing up towards the end, a fact that I conveniently forget to tell everyone when I crow about my score. The fireworks are approaching but another quick ride on Buzz for everyone is fitted in. We walk up to the hub in perfect time and can pick our spot in front of the castle as a lot of people have left due to the cold. I'm not sure why but Tink doesn't put in an appearance, however the fireworks are as good as ever. The park is nearly closing, so what do we do? Why, rush over to ride the Haunted Mansion of course! These O'Rourke's are people after my own heart! I really do love this attraction, it is one that you can repeat time after time and not get bored. A slow walk down Main Street and it is time to say goodbye to Ronnie, Mike and Jill. 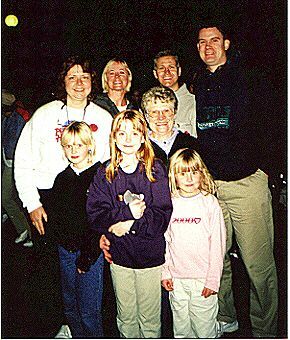 Grandma says to me later that we managed to talk about WDW nearly all the time we were in the park. Yep! That's the idea, Grandma! It has been a lovely day that we have all enjoyed, let's hope that we can all meet up again soon. Hey Ronnie, it's about time you made it over this side of the water! We arrive back at Dixie Landings at 8:00. We intend to have a quick snack in the lounge but end up watching a man playing the piano. He really knows how to get the crowd going, playing such varied things as the Flight of the Bumble Bee, YMCA and Brown Eyed Girl in a boogie-woogie style. A couple of pitchers of beer disappear as we have a foot stompin' table thumpin' time. Grandma and India get up and do the Macarana and then the Conga. We finally leave just after 10:00 and fall into bed.